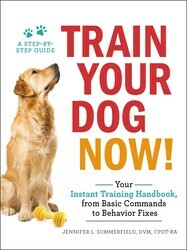 by Jennifer Summerfield, author of Train Your Dog Now! Having a well-mannered dog takes a lot of work and patience. A common problem that dog owners face is a having a dog that wants to jump to say hello. Although a jumping dog is totally normal, it can be dangerous around small children, especially if it’s a big dog. Jennifer L. Summerfield, author of TRAIN YOUR DOG NOW! shares helpful tips to stop your dog from jumping on people. If you have a friendly dog, you probably spend a lot of time trying to keep him from knocking people over when he wants to say hi. This is a very common problem, so don’t worry—there’s nothing wrong with your dog at all. Wanting to jump up to say hello is very normal, especially if your pup is excited about meeting someone new. Of course, most of us would prefer that our dogs not do this. Jumping on people is annoying at best, and can be dangerous with large, strong dogs, especially when greeting children or elderly people. Resolving this problem will take some work (and lots of consistency!) on your part, but it’s well worth the effort to have a well-mannered dog who can say hello politely. AT FIRST, MAKE THINGS EASY Start with your dog on-leash and in a fairly quiet environment. You will need a helper for the first several training sessions; this can be a member of your household who your dog. ASK YOUR DOG TO SIT Your helper should approach you and your dog from the front and casually walk past. The helper should not look at your dog or speak to him, and your dog should remain sitting. Use a treat in front of your dog’s nose, if needed, to help keep him focused. Praise and reward with a treat once the helper has passed by. PRACTICE SITTING STILL Repeat step 2 several times, until your dog is able to sit still without any difficulty as your helper walks by. Remember to praise and reward each time—sitting still is challenging for friendly dogs. TRY A QUICK TOUCH This time, ask your helper to briefly touch your dog as he or she walks past. Praise and reward if he holds his sit. If not, just go back to step 2 and practice a bit more, then try again. WORK UP TO MORE PETTING Your helper can slowly progress from a brief touch to a pat on the head or a scratch on the chest until, eventually, she or he can stop and say hello to your dog, pet him, and chat briefly with you just like a “real” stranger would do. Praise and reward your dog every time for holding his sit. REPEAT WITH SOMEONE NEW When your dog can do steps 1 through 5 perfectly with your original helper, repeat the process with someone else. You may need to practice with several different people before your dog is able to hold his sit successfully while meeting a brand new stranger. This is normal, especially for young or excitable dogs. 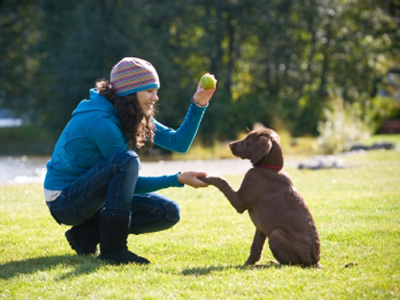 TRY A REAL-LIFE GREETING Once your dog is no longer making any mistakes in training, you’re ready to try out his new polite greeting behavior in real life. Remember that this will be harder for him than practicing with someone he knows, so use lots of treats at first to help him be successful. If he gets too excited and stands up or tries to jump, just back up a few paces to help him calm down, remind him to sit, and try again. Throw a bone to this little guy.